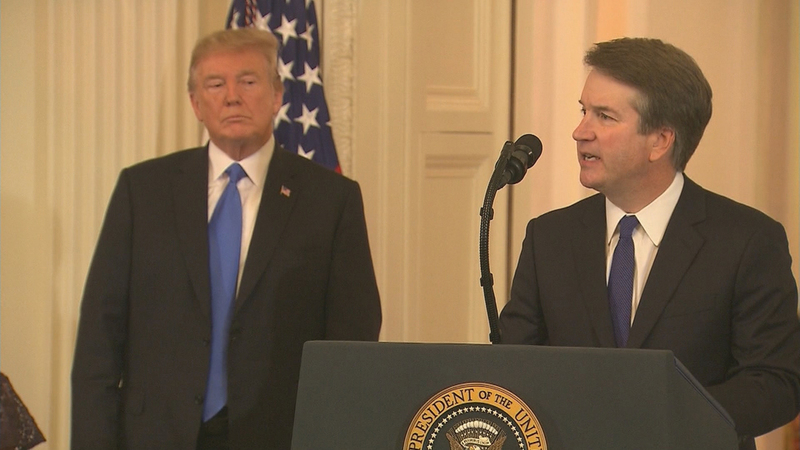 President Donald Trump has nominated Judge Brett Kavanaugh to replace Supreme Court Justice Anthony Kennedy, who announced his retirement at the end of June. Kavanaugh clerked for Kennedy from 1993 to 1994. Despite the buildup to the president’s announcement, CNN reports that Kavanaugh, 53, was Trump’s pick from the start. Kavanaugh wasn’t on the president’s original list of 11 possible Supreme Court nominees compiled by two conservative groups, the Federalist Society and Heritage Foundation. But he was added in November 2017. He started his legal career after Yale Law School and clerkship with Kennedy on special prosecutor Ken Starr’s team working on the Whitewater investigation. He was the lead author of the Starr Report and helped draft the impeachment of President Bill Clinton. The Starr Report outlined Kavanaugh’s belief that misleading the public and lying to staff can be seen as obstruction of justice and grounds for impeachment. However, Kavanaugh’s thinking has changed over the decades. He now says sitting presidents shouldn’t be distracted by criminal investigations and civil lawsuits. In a 2009 Minnesota Law Review article he wrote, “I believe it vital that the President be able to focus on his never-ending tasks with as few distractions as possible." “The indictment and trial of a sitting President, moreover, would cripple the federal government, rendering it unable to function with credibility in either the international or domestic arenas," Kavanaugh wrote. He noted that a president could face prosecution after leaving office or be impeached. “If the President does something dastardly, the impeachment process is available,” Kavanaugh wrote. Currently, special counsel Robert Mueller is considering whether Trump and some of his family members obstructed justice in the investigation of Russia’s interference in the 2016 presidential election. It’s also possible the Supreme Court could rule on Trump’s plethora of legal problems and a number of potential issues that have never been before the court, including the question of whether a president can pardon himself and whether he can be forced to comply with grand jury subpoenas. “And President Trump knows that Kavanaugh will be a barrier to preventing that investigation from going there,” added Schumer. But abortion-rights advocates worry that if Kavanaugh is confirmed, the Supreme Court will chip away at Roe v. Wade. Joining us to talk about Kavanaugh’s nomination: Illinois Solicitor General David Franklin, a professor at DePaul College of Law who also clerked for Justice Ruth Bader Ginsburg from 1999 to 2000; and Ashley Keller of the law firm of Keller Lenkner LLC who clerked for Kennedy from 2008 to 2009.